A total of 319 cases of oral cancer were recorded, 173 of them (54.2%) were male and 146 cases (45.8%) were female. The majority of patients (92.1%) were over the age of 40 years. The peak of occurrence was in the seventh decade of life [Table 1]. Squamous cell carcinoma was the most common type, accounting for 90.3%, followed by salivary gland neoplasms accounting for 4.7% and Burkitt's lymphoma, malignant melanoma, sarcoma, and malignant fibrous histiocytoma accounting for 2.2%, 1.3%, 1.3%, and 0.3%, respectively [Table 2]. Of the 288 cases of squamous cell carcinoma, 157 cases were male and 131 cases were female. The majority of patients (96.1) were over the age of 40 years. The peak age of occurrence was the seventh decade of the life [Table 3]. The majority of squamous cell carcinoma was on the gingiva, accounting for 30.6%, followed by the tongue (30.2%), the lip (12.8), the floor of the mouth (9.4), the buccal mucosa (9.0%), the major salivary glands (3.8%), the maxillary sinus (3.5%), and the palate (0.7%) [Table 4]. The gingiva was the most frequent site accounting for 27.9%, followed in descending order by the tongue (27.3%), the lip (11.6%), the floor of the mouth (8.5%), the buccal mucosa (8.2%), the salivary glands (6.6%), the maxillary sinus (4.4%), jaw bones (3.1%), and the palate (2.5%) [Table 5]. There were 89 cases of the gingiva, 54 cases (60.7%) were male, and 35 cases (39.3%) were female. Most patients (96.5%) were over the age of 40 years [Table 6]. Eighty-eight cases (98.8%) of gingival cancers were squamous cell carcinoma and the remaining one case (1.1%) was a malignant melanoma [Table 7]. Eighty-one cases (91%) of gingival cancers were on the lower gingiva and 8 cases (8.9%) were on the upper gingiva [Table 8]. 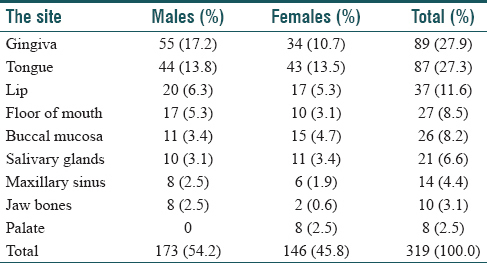 Tongue was the second commonly affected site, where 87 cases were recorded, 44 cases of theme (50.6%) were male and 43 cases (49.4%) were female. Most of the tongue cancer patients (94.4%) were over the age of 40 years, with a peak occurrence in the seventh decade of the life [Table 9]. All the tumors found on the tongue were squamous cell carcinoma. Seventy-two cases (82.8%) of the tongue cancers were located on the anterior two-thirds of the tongue and 15 cases (17.2%) were in the posterior one-third (base) of the tongue [Table 10]. Forty cases (46.0%) of tongue cancers were found on the right side, and 47 cases (54.0%) were found on the left side [Table 11]. Shammah use (is the traditional name of smokeless tobacco type of snuff dipping in the Arabian Peninsula particularly in Yemen and Saudi Arabia) was the main risk factor, and 65.2% of all oral cancer patients were shammah users, followed in descending order by qat chewing (traditional habits among Yemenis) (49.5%), mada'a (type of smokeless tobacco) (30.7%), and cigarette smoking (18.5%). The less common risk factors were outdoor work (long-standing exposure to sunlight) (10.0% for lip cancers), trauma (7.2%), chronic infection (3.4%), wood burn (2.8%), alcohol (2.5%), fair skin (1.9% for lip cancers), radiotherapy (1.3%), and hereditary disorders (0.3%) [Table 12]. Shammah use was the main risk factor among this group of patients. Out of 319 cases of oral cancers, 208 cases were using shammah. Of these, 173 cases were male, and out of them, 119 cases (68.8%) were shammah users. 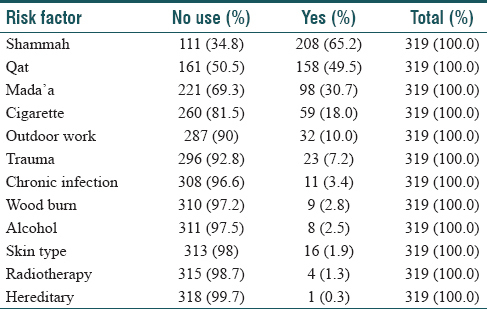 There were 146 cases of female patients, 89 cases of them (61%) were shammah users [Table 13]. The relationship between shammah use and the type of oral cancers was significant (P = 0.000). 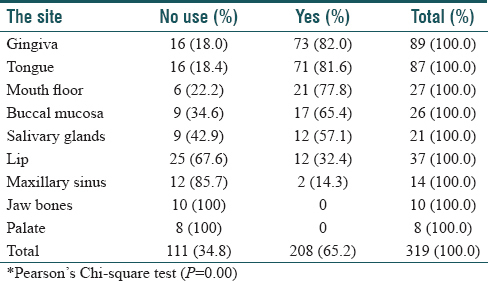 More than 70% (70.5%) of patients with squamous cell carcinoma and 27% of patients with salivary gland tumors were shammah users [Table 14]. The relationship between shammah use and the anatomical site was significant (P = 0.000). The gingiva was the comments affected site (82.0%), followed by the tongue (81.0%), the floor of the mouth (77.8%), the buccal mucosa (65.4%), the salivary glands (57.1%), the lip (32.4%), and the maxillary sinus (14.3%) [Table 15]. National Cancer Institute. What You Need To Know About Oral cancer. Risk factors; 2004. Available from: https://m.mycareplusonlin.com. Castellsagué X, Quintana MJ, Martínez MC, Nieto A, Sánchez MJ, Juan A, et al. The role of type of tobacco and type of alcoholic beverage in oral carcinogenesis. Int J Cancer 2004;108:741-9. Cawson RA, Odell EW. Textbook of Essential of Oral Pathology and Oral Medicine. 7th ed. London: Churchill Livingston; 2002. p. 243-53. Chidzonga MM, Mahomva L. Squamous cell carcinoma of the oral cavity, maxillary antrum and lip in a Zimbabwean population: A descriptive epidemiological study. Oral Oncol 2006;42:184-9. Sawair FA, Al-Mutwakel A, Al-Eryani K, Al-Surhy A, Maruyama S, Cheng J, et al. High relative frequency of oral squamous cell carcinoma in Yemen: Qat and tobacco chewing as its aetiological background. Int J Environ Health Res 2007;17:185-95. Basaleem HO, Bawazer AA, Zain Al-Sakaf KA. Head and Neck Cancer: Is it a problem among Yemeni patients (A five year retrospective study) Journal of Natural and Applied Science 2005;9:1. Mackie I. Oral Carcinoma and Their Relationship to Qat and Shammah Abuses (Dissertation). Germany: University of Heidelberg; 1995. Rehman K, Monaghan A. Epidemiology of Oral Cancer in the West Midlands, UK. Oral oncology supplement; 2009;3:118. Available from: http://www.researchgate.net/publication/23930834-0186-Epidemiology of oral cancer in the West Midlands-UK. Balaram P, Sridhar H, Rajkumar T, Vaccarella S, Herero R, Nandakumar A. Oral cancer in Southern India: The influence of smoking, drinking, pan-chewing and oral hygiene. Int J Cancer 2002;98:440-5. Idris AM, Ahmed HM, Malik MO. Tombak dipping and cancer of the oral cavity region in the Sudan. A case – Control study. Int J 1999;63:477-80. Onyango JF, Omondi BI, Njiru A, Awange OO. Oral cancer at Kenyatta national hospital, Nairobi. East Afr Med J 2004;81:318-21. Moore SR, Allister J, Roder D, Pierce AM, Wilson DF. Lip cancer in South Australia, 1977-1996. Pathology 2001;33:167-71. Mehanna P, Smith G. Maxillary Carcinoma. Case Report. Canadian Family Physician. Le medicine de famille Canadian 2009;55:262-4. Gervásio OL, Dutra RA, Tartaglia SM, Vasconcellos WA, Barbosa AA, Aguiar MC, et al. Oral squamous cell carcinoma: A retrospective study of 740 cases in a Brazilian population. Braz Dent J 2001;12:57-61. Agrawal KH, Rajderkar SS. Clinico-epidemiological profile of oral cancer: A hospital based study. Indian J Community Healthy 2012;24:80-5. Ostman J, Anneroth G, Gustafson H, Tavelin B. Malignant salivary gland tumors in Sweden 1960–1989 – An epidemiological study. Oral Oncol 1997;33:169-76. Sun EC, Curtis R, Melbye M, Goeder JJ. Salivary Gland Cancer in the United States. Cancer Epidemiology, Biomarker & Prevention 1999;8: 1095-100. Ali NS, Nawaz A, Rajput S, Ikram M. Parotidectomy: A review of 112 patients treated at a teaching hospital in Pakistan. Asian Pac J Cancer Prev 2010;11:1111-3. Sylvie E, Jean K, Alain C. Skin cancers after organ transplantation. N Engl J Med 2003;348:168-91. Kumar SK, Zain RB. A etiology and risk factors of oral cancer. A brief overview. Ann Dent Univ Malaya 2004;11:41-50. Shiboski CH, Schmidt BL, Jordan RC. Tongue and tonsil carcinoma: Increasing trends in the USA population age 20-44 years. Oral Cancer 2005;103:1843-9. Armstrong BK, Kricker A. The epidemiology of UV radiation induced skin cancer. J Photochem Photobiol 2001;63:8-18. Sargeran K, Murtamaa H, Safavi SMR, Vehkalahti M, Teronen O. Malignant oral tumor in Iran: Ten-years analysis on patient and tumor characteristics of 1042 patients in Tehran. J Craniofac Surgery 2006;17:1230-33. Warnakulasuriya S, Trivedy C, Peters TJ. Areca nut use: An independent risk factor for oral cancer. BMJ 2002;324:799-800. Tomar SL. Trends and patterns of tobacco use in the United States. Am J Med Sci 2003;326:248-54.
International Agency for Research Cancer. Monograph on the Evaluation of Carcinogenic Risk to Humans. Smokeless Tobacco and Some Tobacco-Specific Nitrosamines. Vol. 89. Lyon: IARC Press; 2004.